Acqualina Resort & Spa, a member of the Haute Hotel Network, invites guests to experience the Valentine’s Day Spa packages at Acqualina Spa by ESPA through the month of February. Single or celebrating with a sweetheart, guests can indulge in lavish treatments, champagne and spectacular ocean views that will guarantee a Valentine’s Day to remember. Couples’ Private Lessons offer a relaxing and pleasurable class where couples learn to ease their partner’s tensions. The Sensory Journey starts by selecting an aroma oil of your choice and then moves on to a private lesson with an Acqualina Spa by ESPA therapist. The lesson finishes up with an hour of private time in a Private Couples Suite with a glass of champagne, a healthy Bento lunch for two and, to top it all off, chocolate truffles. All couples go home with ESPA oils and the first ten couples to book this experience will also receive an ESPA Twilight Tea Candle. Singles can discover deep relaxation and feel visibly refreshed with an ESPA holistic facial and body massage accompanied by a glass of champagne if they choose The Singular Sensational Spa Day. The treatment starts with a comforting facial cleanse and facial massage to ease tension and release impurities, followed by warm oils to the body and a tension melting massage performed by an ESPA therapist. The Romantic Escape package gives couples the chance to hide away in a private spa suite followed by a peaceful two-hour escape of their choice. After the treatment, the couple will receive one hour of leisure time, which begins with a heated shower for two, delectable Bento Box lunches and a bottle of Perrier-Jouët champagne and a chocolate delicacy. 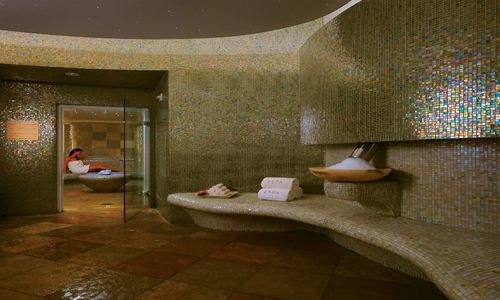 Guests are encouraged to arrive 60 minutes prior to their treatment time to enjoy the exclusive spa facilities. Facilities include Finnish Saunas, Crystal Steam Rooms, Experience Showers, Ice Fountains, Relaxation Lounges, a private spa pool and a heated jet pool with a Roman Waterfall. After relaxing, the Costa Grill invites you to enjoy an astonishing view of the Atlantic Ocean under the stars while dining on a four-course dinner. The evening of romance includes dinner, rose petals and is accompanied by live music for $125 per person. Available Tuesday, February 14th, 7:00- 10:30 pm. Dinner seating at 7pm and 9pm. For Italian lover’s, Il Mulino is also offering a romantic and elegant culinary experience for a grand finale to your Valentine’s Day. This acclaimed Italian restaurant is renowned for their market fresh daily specials, extensive selection of fine Italian wines and faultless wait staff. Available Tuesday, February 14th, 5:30 – 10:30pm.